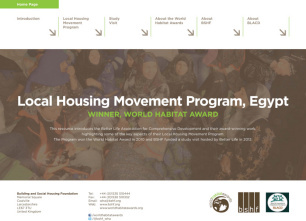 This report presents the outcomes of our peer exchange to Egypt to look at the work of World Habitat Award winner, Local Housing Movement. The World Habitat Award for innovative and sustainable housing solutions was presented to the Local Housing Movement Program at the United Nations global celebration of World Habitat Day in Shanghai, People’s Republic of China in 2010. This report showcases the work of the Local Housing Movement Program and also includes information about the BSHF-funded peer exchange which took place in Egypt in 2012, as well as a presentation of the key lessons learned and links to a range of additional related reports and resources. Aspects of the project which are highlighted in this report include the integrated development approach which involves the improvement of physical living conditions along with the provision of legal help to secure land rights; raising awareness of health, social and environmental issues; and the development of partnerships with the private sector to fund the implementation of water, sanitation and improved housing projects. The training of construction workers in environmentally sustainable construction techniques and building the capacity of local community-based organisations has also helped to build long-term sustainable futures for the communities involved.